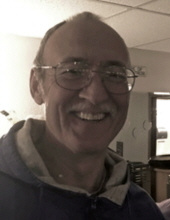 Robert “Tony” DePouw, 63, Oconto, passed away Sunday, February 3, 2019 at his home surrounded by his family. Tony was born April 6, 1955 in Oconto to Robert and Theresa (Konkel) DePouw. He married Louise Grant on May 14, 1977. He enjoyed softball, bowling, skiing, golf, hunting and fishing. Tony was always willing to give a helping hand to anyone who needed it. He was a member of Holy Trinity Catholic Church, Oconto. Tony is survived by his wife, Louise DePouw; mother, Theresa DePouw; two daughters, Jenny DePouw, Rachel (Scot) Skarda; two sisters, Carol (Todd Drake) DePouw, Judy (Gary) Scray; two brothers, Jerry DePouw, Pete (Julie) DePouw; six grandchildren, Rebecca (Josh), Riley, Trent, Rex, Parker and Michael; and one great-grandchild, Eli. He was preceded in death by his father, Robert DePouw and both his maternal and paternal grandparents. The family will receive relatives and friends at Holy Trinity Catholic Church, Oconto, from 9 to 11 AM Thursday, February 7, 2019. Mass of Christian burial will be celebrated 11 AM Thursday at the church with the Rev. Joel Sember officiating. Online condolences may be expressed at www.gallagherfuneralhome.net. To send flowers or a remembrance gift to the family of Robert Tony DePouw, please visit our Tribute Store. Mass of Christian Burial by Rev. Joel Sember. "Email Address" would like to share the life celebration of Robert Tony DePouw. Click on the "link" to go to share a favorite memory or leave a condolence message for the family.